One problem with conventional reciprocating steam locomotives is that when the horizontal motion of the pistons is converted into rotary motion of the drive wheels, the torque produced is not constant throughout the rotation of the drive wheels. Instead, the torque has high points and low points as the drive wheels rotate. If the torque output was plotted on a graph, it would be represented as a sine wave, having high points and low points. So, the torque is not constant. What's the big deal? One of the important design considerations of a steam locomotive is the weight on the drivers. A steam locomotive must put enough weight on the drivers to prevent the wheels from slipping, especially when starting a train. If the torque produced by a steam locomotive was constant, wheel slip would be less of a problem and weight on drivers would not be as important. Another problem with conventional reciprocating steam locomotives is that the side rods and valve gear become difficult to balance when the locomotive is traveling at high speeds. The side rods weigh a lot. When a steam locomotive is travelling at speed, the weight of the side rods is being thrown up and down. Unless it is perfectly balanced, the up and down motion "pounds" the rails. The pounding of rail produces stresses and increases maintenance on the tracks. If this pounding could be reduced, less track maintenance would be required. In the 1920s and 1930s, the locomotive builders in the USA began looking at turbine power like that which was used in steamships and stationary power plants as an alternative to the more traditional reciprocating power. During the following decades several steam-turbine designs were tested and used. However, none were really a success. Steam turbines made great nautical motors, where the hull of a ship provides a comparatively clean and cushioned environment. On the other hand, railroad locomotives get dirty while they are running over the road. Also, freight locomotives are involved in many low speed, high impact collisions coupling up to trains. Passenger locomotives, with a fixed consist, were safe from the violence of coupling onto a train, but surprisingly, their higher speeds made them even dirtier than a freight locomotive travelling at a slower thirty or forty miles an hour. 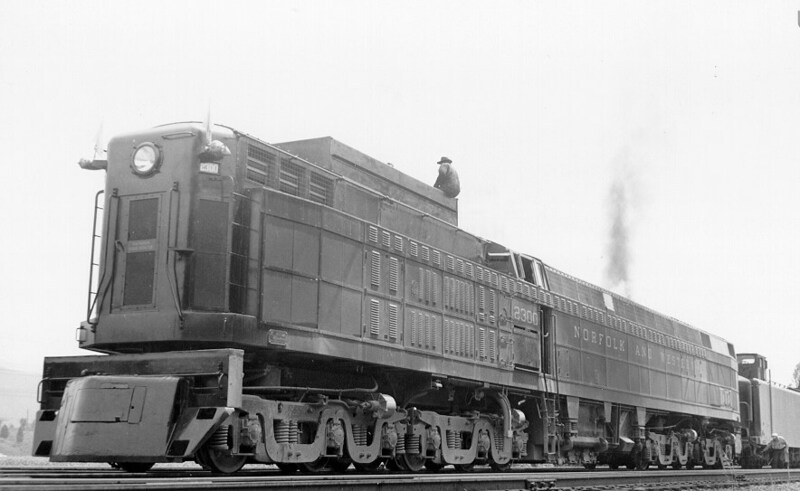 In an attempt to compete with General Motors passenger diesels, General Electric built a pair of steam-turbine-electric locomotives in 1938 for use on the Union Pacific Railroad. They were built over three years at the General Electric Plant in Erie, PA at a cost of around $2,000,000 and were the first turbine-electric locomotive built is the USA. They were built to look like the EMD diesels that were being introduced around the same time. The wheel arrangement of both locomotives was 2-C+C-2. They were rated at 2,500 horsepower each and able to attain speeds up to 125 MPH. After several trial trips made over the New York Central, they left the Erie works Saturday April 1st, 1939 for Omaha, NE for the Union Pacific where they were to be used to pull streamlined passenger trains throughout the west. The UP ran them on a few test trips and sent them around the country on a publicity tour. They were only "operational" for 6 months before returning to GE in late 1939. Subsequently, they did some work for the GN and NYC in 1943 during the motive power shortage during the war but it was deemed that they would be more useful as raw material and were scrapped by GE in 1943. These were the only two condensing steam locomotives built and operated in North America and were engineering triumphs but again practical failures. 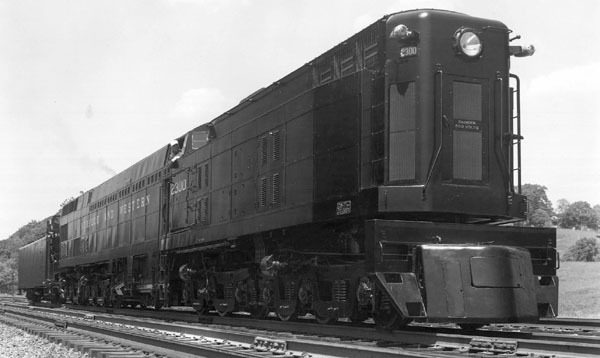 In 1944, the Pennsylvania Railroad received a Baldwin-built straight steam turbine where the turbine was geared down and directly connected to the drivers. It looked much more like a regular steam locomotive than the previous UP models. The most obvious visual clue that it was not a "normal" steam locomotive was that it had no cylinders nor main rods. It still had side rods connecting the main drivers. Class S2 number 6200 was built with a new wheel arrangement: 6-8-6. Initially, it was designed to be a 4-8-4. However, because of wartime restrictions on lightweight metals, the increased locomotive weight required the larger pilot and tender trucks. It had two steam turbines, one large one for forward movement and one small one for backup movements. It could travel at higher speeds with smaller (68 inch) drivers. It did not "pound" the rails as badly as other steam locomotives. It did not produce the "normal" chuffing sound. Instead it produced a loud swoosh sound. It too was unsuccessful. Once it got up to speed it could outpull anything on the rails at the time (including 6000 HP diesel lashups) but most locomotives didn't spend that much time rocketing across the plains at 100 mph. Below 40 miles per hour, it used an enormous amount of steam and coal. It was used in passenger service between Crestline, OH and Chicago, IL. before being placed in storage in 1949 and later scrapped along with most of the PRR duplex-drive locomotives. In 1944 the Pennsylvania Railroad also had plans for a large streamlined turbine locomotive to be built by Westinghouse and Baldwin. It was to be a mechanical drive locomotive and classified as "Class V1". However, the design was changed to a non-traditional steam-turbine-electric with a Bowes drive between the turbine and the common-shafted axles (there were no independent traction motors in the design) of the eight-wheel trucks. The boiler was a modified Q2 turned around with the grate dropped down over the second lead truck. It is unclear exactly why one was never built. It was most likely because of the gaining popularity of diesel locomotives around that same time. C&O 500. Harold K. Vollrath collection. By 1945 it was obvious that the diesel electric, with its higher low speed tractive effort, cheaper and easier to handle fuel source, and ease of maintenance and higher availability, was here to stay and steam was on the way out. The C&O was a major coal hauler and thought the only way to save steam was to combine the benefits of electrical traction motors to a coal fired steam turbine which generated electricity for the traction motors. With the help of Baldwin and Westinghouse, the C&O built three steam turbine electrics. Number 500 was built in 1947 and numbers 501 and 502, in early 1948. They had conventional fire-tube boilers mounted backward to regular practice. They were streamlined and looked like nothing else on the rails. They were built for speeds of 100 miles per hour. The only problem was that they were incredibly complex. They spent much more time in the shop than on the rails. The book C&O Power has a few good photos including one with the streamlining removed. It looked like a pipe fitters nightmare. By 1949 they were on the dead line and all three were quietly scrapped in 1950. The C&O heavily promoted the 500 as the locomotive of the future and advertised them pulling the soon to be placed in service "Chessie" passenger train. The Chessie was to have four dome cars and one of the lounges had a large warm water aquarium with tropical fish. Yet, the train never made its debut in the summer of 1948. There were strikes at Baldwin, Pullman and Budd in 1947 that delayed the equipment, and testing the 500 was not going well. In February 1948 the B&O launched their own streamliner between Cincinnati and Washington DC. That train stole the Chessie's thunder, and also showed the C&O how minuscule the daytime Cincinnati Washington passenger train market really was. In 1947, during test runs, the 500 had many service failures. The C&O also found out the tropical fish in the aquarium died due to the train's vibrations. Yet the main problem was the 500. There were many bugs in this long and complicated machine. It was 106 feet long and weighed 856,000 pounds. It had five trucks in a 2-C1-2-C1-B arrangement. Only the first three axles on the eight-wheel trucks were powered. The trailing truck was powered, but the leading truck and the one in between the big powered trucks were not powered. That four-wheel truck supported the firebox. Coal was carried in a hopper at the nose of the locomotive, a streamlined cowl makes this look like a boiler from ground level, but the fire box was behind the cab and the boiler stretched back toward the tender. Coal dust fouled the forward traction motors and water dripping from the boiler often short circuited the traction motors on the other two powered trucks. The C&O was never able to get the 500 or her two sisters to go all the way from Washington to Cincinnati in a single day, they always broke down. By June of 1948, the gig was up, and the nation's leading hauler of bituminous coal began to rapidly dieselize. Westinghouse-Baldwin Gas Turbine Electric #4000 "The Blue Goose"
Baldwin 4000. North East Rails collection. This experimental locomotive was built in 1950 and slightly resembled earlier Baldwin "Sharknose" units in appearance. It was painted light blue and gray with orange stripes and quickly received the nickname "Blue Goose". It employed relatively small dual turbines to produce 4,000 horsepower and was equipped for passenger train heating. The carbody could slide transversely over the trucks while being constrained with centering springs producing a very smooth ride. It was designed to travel at 100 MPH and was tested in heavy freight service on the Pittsburgh & Lake Erie and Union railroads. It was tested in passenger service on the Pennsylvania Railroad. Tests were also performed on the Missouri-Kansas-Texas and Chicago & North Western. 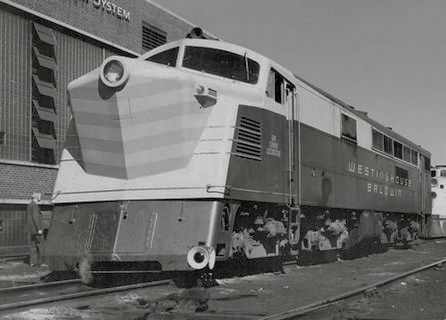 While apparently being successful in its test runs and outperforming a pair of EMD E7 diesels, Westinghouse could still not find a buyer so the unit was returned to Pittsburgh and scrapped in 1953. However, the original bell and serial number plate reportedly still exist. Model Railroader Cyclopedia - Volume 2 Diesel Locomotives, pages 158 - 159. Norfolk & Western 2300. Retroweb collection. 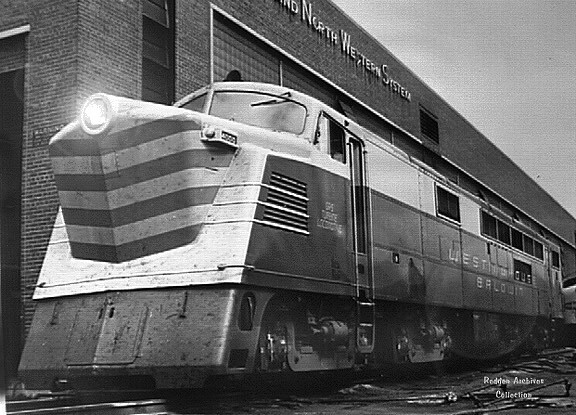 In 1954, the Norfolk & Western received a Baldwin-Lima-Hamilton and Babcock & Wilcox-built a steam-turbine-electric named "Jawn Henry" that looked similar to the C&O attempt. It was shorter, weighed less, and had a Babcock & Wilcox "marine type" water tube boiler (some sources say flash boiler) that operated at 600 psi. and delivered steam at 900 degrees F. It had Westinghouse generators and traction motors, and rode on four, three axle trucks. All axles were powered so the "Jawn Henry" was a C-C+C-C locomotive. The name given to this locomotive, "Jawn Henry" was taken from the legendary black construction worker who pitted his hammer and drill against a steam drill and died in the attempt. Although it could be said that the "Jawn Henry" was superior to the Y6b, it lasted only three years. There were several problems with 2300. Most of them were worked out during its short life. Some of these problems included the turbine blades getting out of whack when the locomotive coupled onto a train, fly ash kept getting into the electrical machinery, and problems with the feedwater heater and semi-automated boiler controls. Its major Achilles heel as the water delivery turbine and pump, which had to be constantly replaced due to high operating speed. Although none of these were a "show stopper", the locomotive was mainly used as a "pusher" and was scrapped in 1958. Perhaps if the 2300 was introduced 10 years earlier and did not have to compete against a four-unit "F" consist, it may have had a longer life. Rails Remembered, Vol. 4, The Tale of a Turbine, by Louis M Newton. The Union Pacific always prided itself in having the largest locomotives. Instead of using a series of diesels to pull their larger trains, the UP preferred a single, large locomotive which, in theory, would require less maintenance than several smaller locomotives running together. Examples of this preference include the "Big Boys", "Centennials", and the "4-12-2s". In 1948, ALCO-General Electric built a gas-powered turbine prototype locomotive which the Union Pacific tested but never owned. Like other turbine locomotives, fuel efficiency was poor. However, the poor fuel efficiency was offset by the cheaper "Bunker C" fuel that it burned. They functioned like diesel-electric locomotives. Instead of having a diesel engine drive a generator, they used a turbine to drive a generator. With the intention to eventually replace the "Big Boy", over the next decade, the UP had over 50 units built in three stages. They were mainly used between Council Bluffs, IA and Ogden, UT. They were unpopular in cities because of the loud turbine noise. They became known as "Big Blows" because of the noise they made. Each of the three groups evolving in design. Distinguishing features of each of the groups are as follows.